Are you curious about the pros and cons of induction cooking? 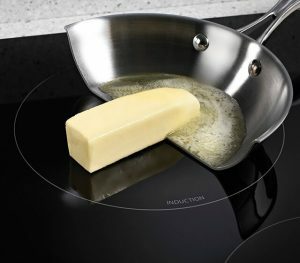 Depending on how deep you want to get into the nitty gritty of the pros and cons of induction cooking and how it works, there are plenty of sites out that that will break down all of the particulars, but I’m not going to do that here. Frankly, reading some of those sites when I started, while packed with useful information, made my eyes glaze over. I’m going to do my best to break it down to the basics for those who just want to get an overview and judge if it’s the way to go for them. I’ll keep this running as a living document as technology moves forward and new insights come out. If you want to dig deeper into how this all works, and it can go fairly deep, you can find a plethora of information with a quick search in Google, but here’s a quick link to Consumer Reports and to an article in the New York Times a few years ago. Check out our Induction Cooking Product Reviews! Less than 15% of the produced heat is lost, way better than gas or electric (which loose 40% or more of produced heat). They give incredible and instant control of how little or much heat is being produced, much like gas. Even basic units can meet or beat the heat, or BTU, ratings of the majority of cooktops out there, both domestic and commercial. No heat is produced by the cooktop thus safe should adult or child accidentally put their hand on it. Also, no frustrating cleanup from baked on food. Precise results, every time, once you get through the learning curve. One possible downside to induction cooking is that you may need to buy some new pots and pans, as it only works with ferrous metals; see also cast-iron (my favorite) and steel. If a magnet will stick to it, then you’re good! 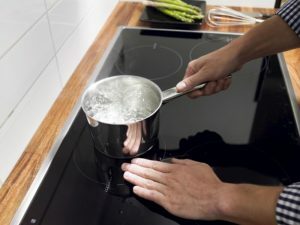 Though there are interface diffusers that are relatively cheap that will allow other types of cookware to work, they’re not as efficient in terms of energy loss. For those who like cooking with gas, you won’t be able to get that “char” to your food. If your electricity goes out, then it’s either crackers for you or a night eating out. 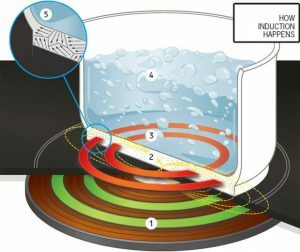 How does induction cooking work, basically? 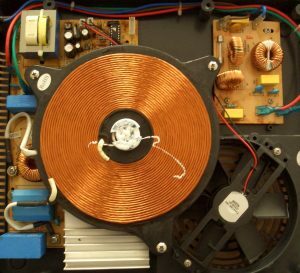 As the electric current flows through the copper coils (1) it generates a magnetic field (2) inducing organized motion of electrons known as eddy currents (3) in the ferromagnetic cookware. This, along with inter-molecular friction know as hysteresis (5) creates heat in the pan walls via the joule effect (4) as the cookware has a higher resistance to this flow of electrons . The quick answer is, it depends. It depends on whether you get a small one piece unit or a whole cooktop, if you get a diffuser or have to replace your cookware. You can get a fairly inexpensive, but decent unit for about $40 or you could go all out and get cooktop with four spots on it for a $900 or more. Beyond that, it all comes down to how fancy you want to get or what you plan on cooking, from ramen to a five star meal! 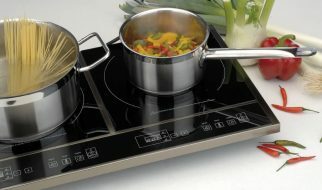 I hope you’ve found this short guide on the pros and cons of induction cooking helpful!